I didn't do goals for last year. Both Wayne and I had set a goal of simply "Do Better." That was our 2013 motto I guess you could say. We did "do better," but I also like having little goals and I like looking back on them from time to time and especially at the end of the year. I don't like calling them resolutions, I like the word goal better. Resolution just sounds so harsh. I might update this list throughout the year or change them as that is what goals are for, right? Great goals! 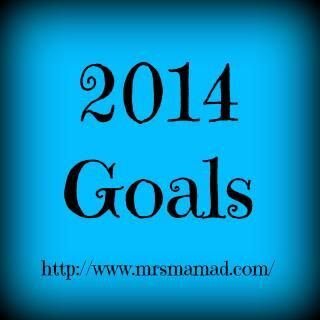 I have very similar goals in mind too for 2014 ;) We can do it! Loving all of these posts about goals & resolutions. It's so motivating! I also have a goal to get more toned and cook more meals at home. It's hard to make those commitments but I think it will be so worth it! The word "resolution" just sets you up for failure. I love having goals. Something to work to, and if you fall short at least progress was made. My goal is to focus on "peace" do a triathlon and get 500 miles of walking/running. I love how many goals you have!